With vray proxy you will can render bilions of poligon without RAM using!. Vray Proxies are one of the most powerful tools in visualization. They make rendering huge landscape scenes possible, and even quite easy. If you have not yet experimented with them, you should. 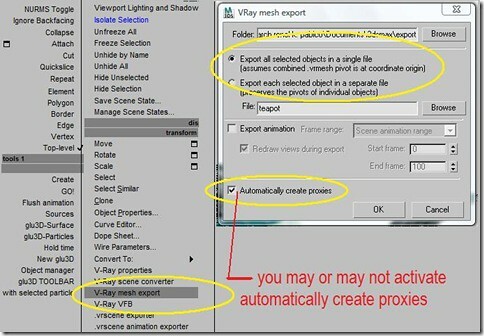 Here we have an excelent Vray Proxy tutorial for you to practice. Vray Proxy is one method of saving a lot of geometry as well as saving a lot of rendertimes by creating an external proxy to your scene. However some procedures might be consider for us not to end up rendering a proxy with just one material. a #preRenderEval MaxScript callback can be used to replace the .vrmesh file name of the proxy object. A suitable callback script can cause different mesh files to be used for each frame, thus creating an animation effect. • If you need to create several proxies linked to the same .vrmesh file, it’s better to make them instances – this will save memory since the .vrmesh file will be loaded only once. • Materials are not saved in the .vrmesh file. Instead, the geometry will be rendered with the material applied to the VRayProxy object. This is because third party materials and procedural textures would be difficult to describe in a general way. In addition, you may want to edit the material independently of the mesh. • The resulting .vrmesh files can be rendered outside of 3ds Max – for example, by the standalone version of V-Ray, or V-Ray for Maya. • Shadow maps will not include information about the proxy objects. If you want the proxy objects to cast shadows, you should use VRayShadows. • You can convert .ply and .obj files to .vrmesh files with the help of the ply2vrmesh converter tool. 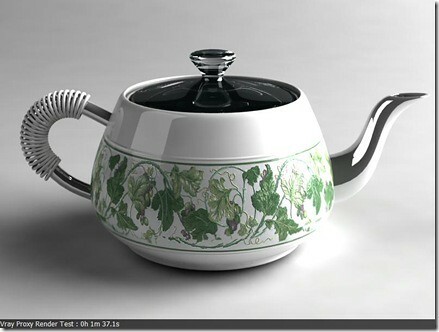 • The V-Ray SDK has methods for reading and writing of .vrmesh files. 1. To start with,let us create some simple objects as an exercise for our vrayproxy. 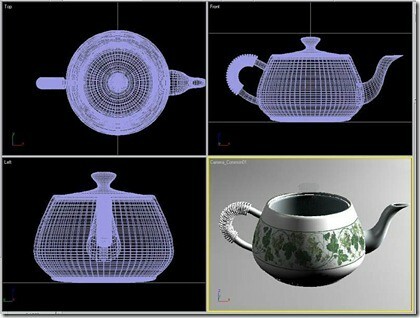 I create a simple teapot, then break it down to component ( body, spout, cover and handle), then applied with diffirent materials. See image below. 3. Once all the objects is aleady attached as one, you can now use vraymeshexport. 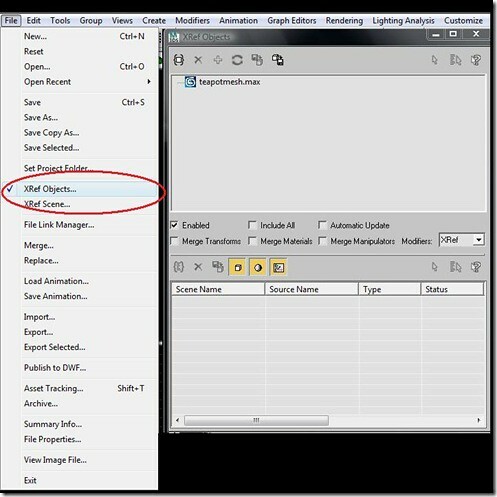 Right click on the object, then on the quadmenu select vray mesh export. then provide necessary information and accept the parameters you prefered. See sample image below. 4. The next thing i do is to selecting the vraymesh object, then go to file menu and select xref object, then save the vraymeshobject as max file. I do this especially if im working on a complex scene. I will show you the reason for this later as we goes on with this simple tutorial. 5. You are now ready to use your vraymesh object as proxy. 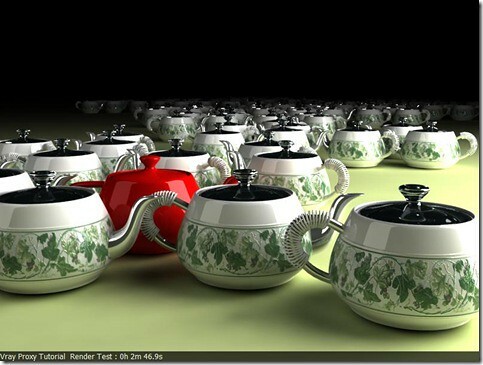 See sample image render with the vrayproxy copied instance about a hundred times. So this this now conclude the process of creating proxy with a simple objects.